The contest begins Sunday, January 19 at 12 am and ends Monday, January 26. The winner will be notified by email within 48 hours and there is no purchase necessary. All you need to do is register below. Ok... so let's talk No Sew Pillows! 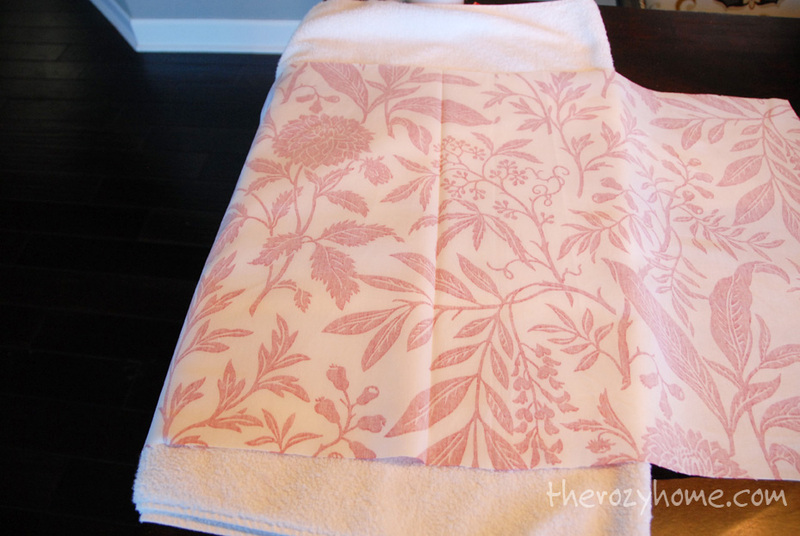 This is one of the best projects to try if you are wanting to venture into no-sew land. While it took me 30 minutes per pillow, most can do it in a lot less time (darn Type A and making sure everything was perfectly even and matched). This is pretty straight-forward but if I have left anything out or you don't understand anything please, please, please let me know and I will try to explain better. 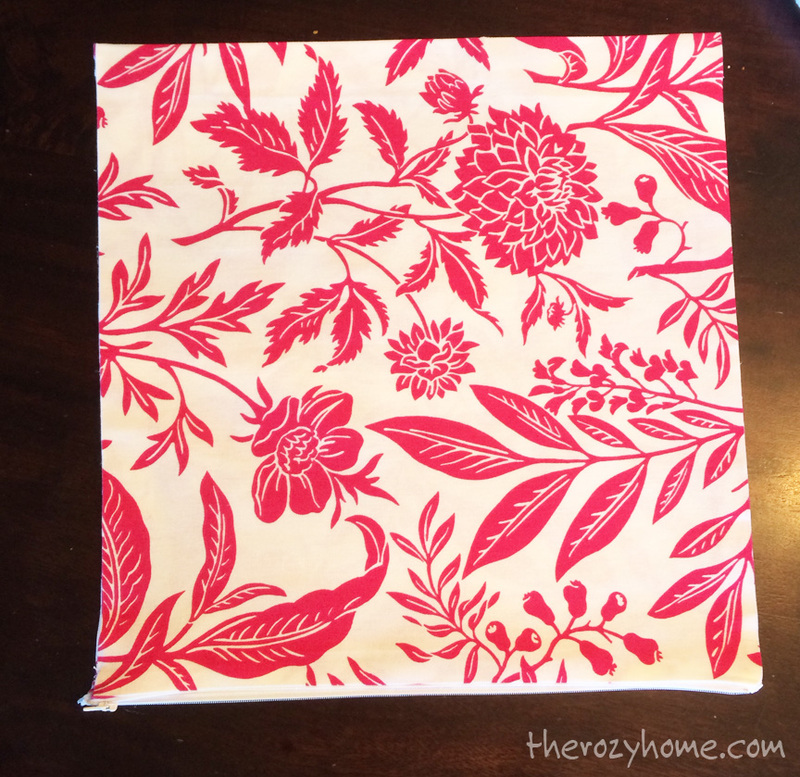 Fabric - For 16 inch pillows, you will need 1/2 yard per pillow. For 18 inch pillows, you will need 3/4 yard per pillow. 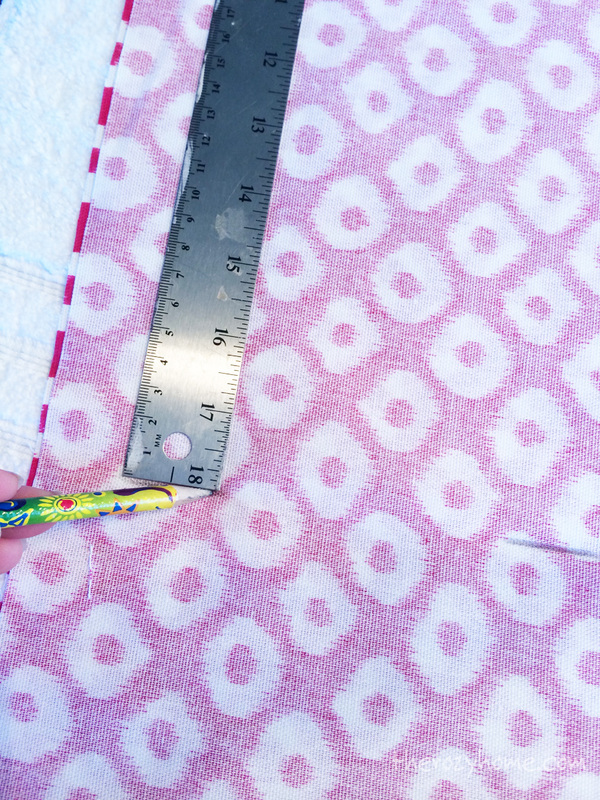 Note: If you are trying to match a pattern perfectly on both sides you will need to add at least 1/4 yard to each of the previous measurements. Iron Fabri-Tac Hem Tape Scissors Zippers - I prefer invisible zippers but they didn't have the size I need. If you are doing 16 inch pillows, get a 14 inch zipper. If you are doing 18 inch pillows get a 16 inch zipper. A few things before I post pics.. I really need a manicure! I was painting my bedroom door black and it's all over my nails so please excuse the funkiness. Also, you will notice the fabric changes. That is because I refined the steps along the way (the more I did, the more I was able to find a better solution). And finally... there are A LOT of pics. Almost 30!!! I seriously took a step of almost every.single.step. I think I overshot everything! Ok...That's it :-). On to the tutorial! Step 1: Decide where you want your pattern to lay. 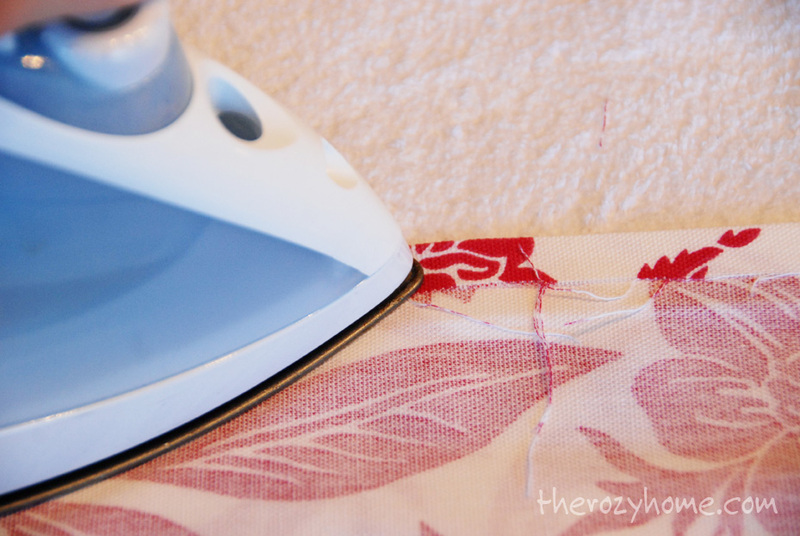 Step 2: Turn you fabric over and iron it on medium heat. Step 3: Turn the fabric pack over and press your crease. Step 4: Open the fabric. 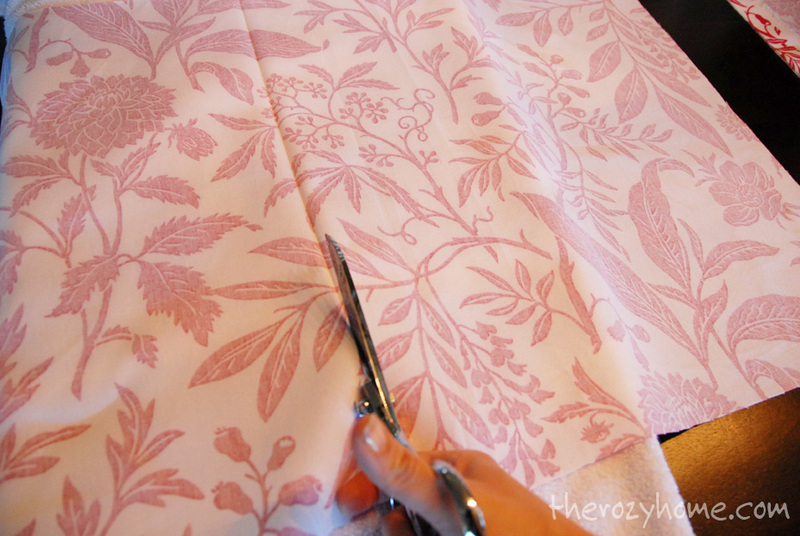 Step 5: Cut the fabric along the crease. Step 6: Lay the cut fabric on top of each other edge to edge. Measure edge to edge horizontally: 18 inches (for a 16 inch pillow) or 20 inches (for an 18 inch pillow). ***In this picture the pattern is facing up, but the fabric should facing down as in the next photo. Step 7: Mark the fabric in three spots. Draw a line connecting the three spots. Cut the fabric along the line. Repeat for top to bottom. Step 9: Turn the fabric so each front side is facing each other (pattern to pattern). 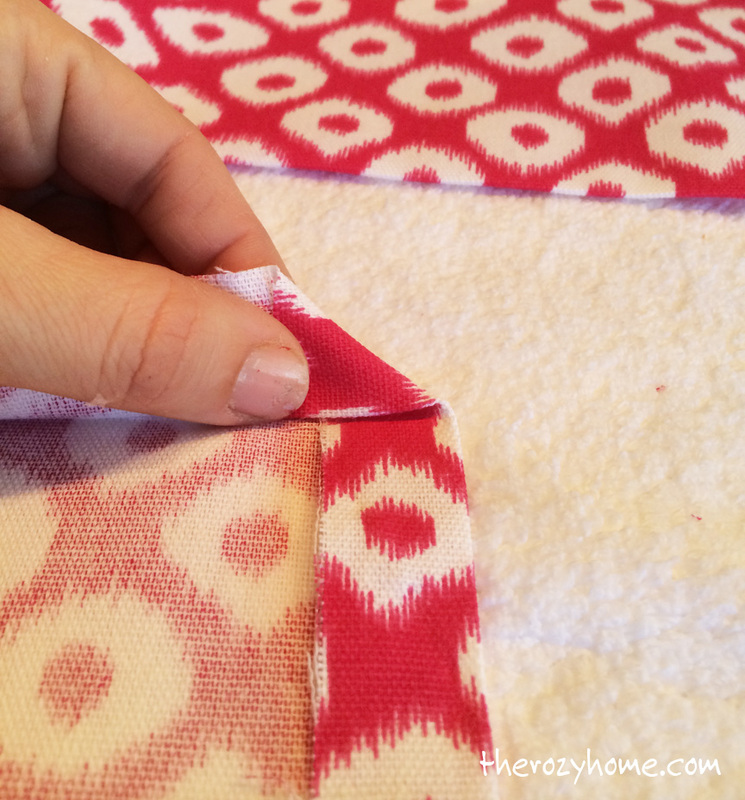 Pin the fabric in all four corners. Step 10: Press your zipper to remove any creases. Set aside. Step 12: Press the fold. Step 13: Repeat on the adjacent side. 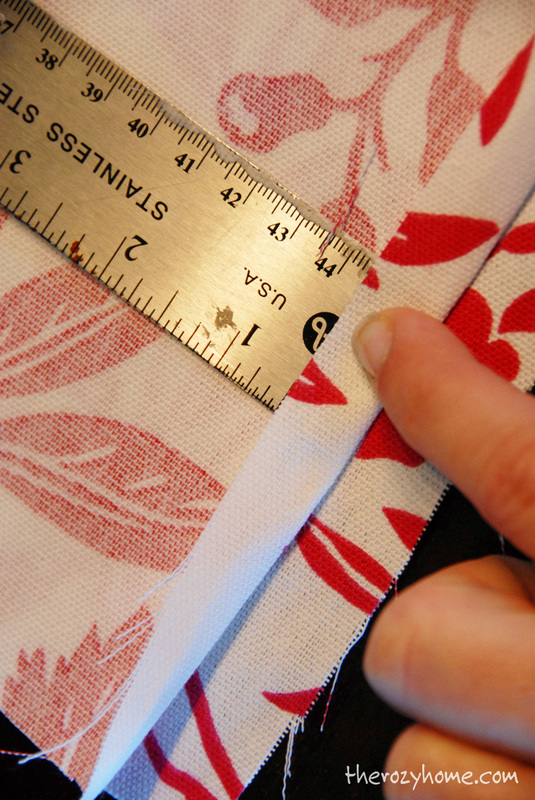 Step 14: Add Fabric Tac to the left of the zipper, from top to bottom. Step 15: Press the fabric onto the zipper trying to get it as close to the zipper track as possible. Note: make sure you center the zipper leaving a one inch gap at the top and bottom. 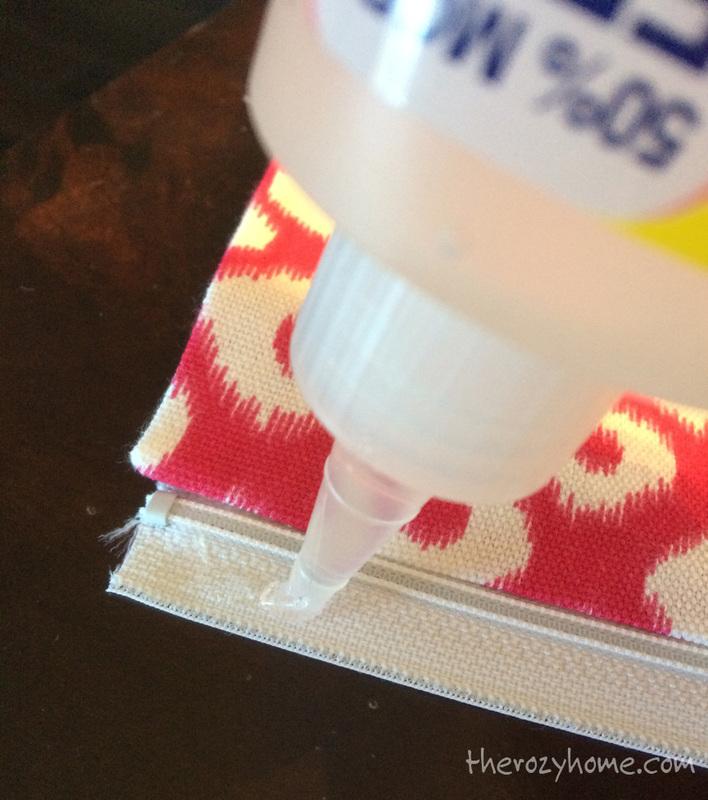 Use Fabric Tac to connect the two sides of fabric above and below the zipper. Repeat on the other side. ** I know in this pic it was already done. Sorry again! Step 16. 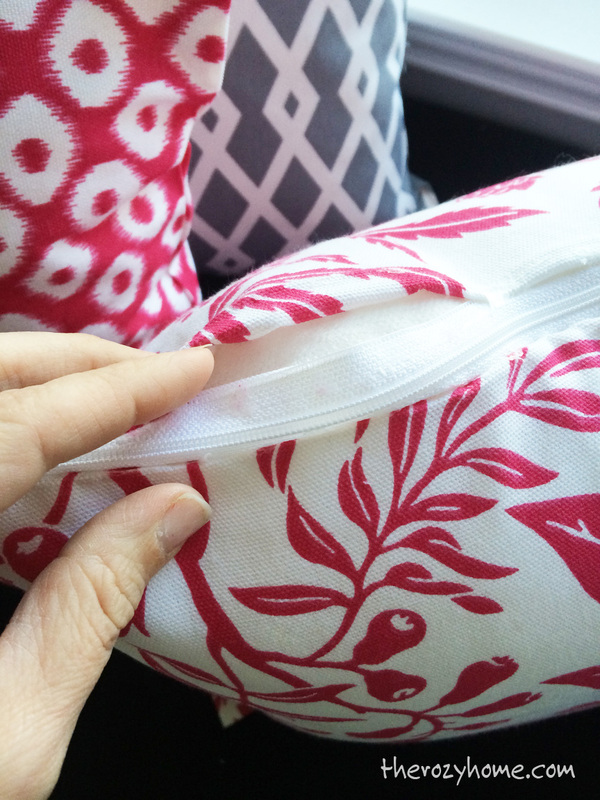 Turn the fabric over and press the zipper down. This is just a "double-check". Important: I would really recommend letting the zipper sit for 10 or 15 minutes before continuing - just to ensure a stronger bond. Step 17: Fold your remaining sides over and press. In a perfect world, you would need to fold them over one inch, but I recommend starting the from the zipper and measuring to the edge of the opposite edge to ensure it is 16 (for a 16 inch pillow) or 18 (for an 18 inch pillow). Do the same thing on the other two sides. Measure fold to fold to make sure they are the correct width. Step 18: Fold the edge/corner of the fabric into a triangle. Step 19: Place a piece of hem tape behind the triangle (between the corner and the fabric). Step 20. Press the corner. 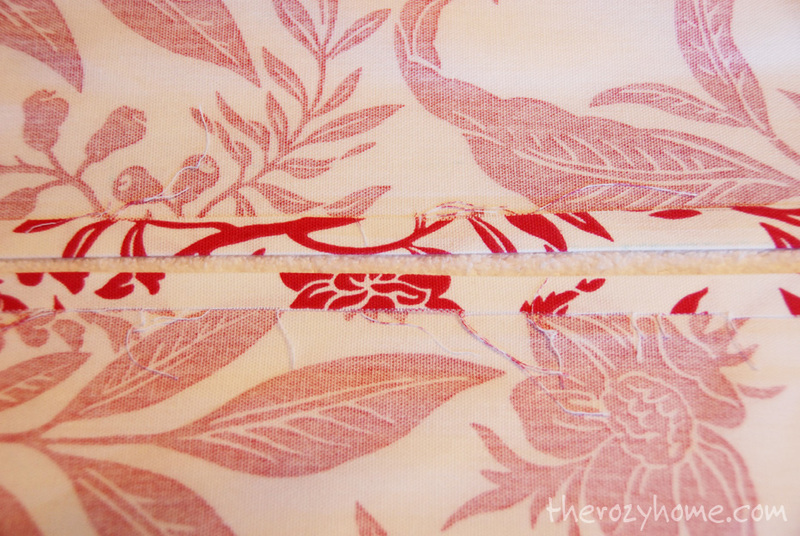 Step 21: Lift the newly pressed corner up and place a piece of hem tape on the fabric. Step 22: Lay the fabric back down and press it. Ok... I know there are some who are wondering why I did the corners in two steps. The iron did not give off enough steam to fuse the two layers of fabric created by the fold. You need your edges to be secured so that they do not pull apart when the pillow is put in. That's it! You have made a no sew pillow! Now a bit of full disclosure. I have been sewing pillows for decades. For me, hands down, sewing them is much easier. But, if you don't know how to sew or don't want to sew, this is a good option. The other thing is in regard to Fabric Tac and hem tape. The next time I do this, I will use Fabric Tac. Period. No hem tape. The hem tape takes a while to bond and sometimes I had to go over it two or three times to get it to attach. It would be much quicker to use Fabric Tac and be done with it. Oh! 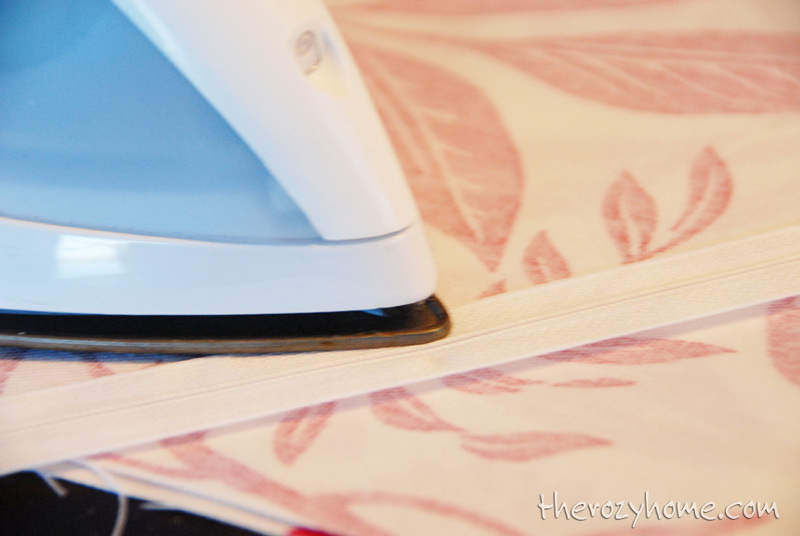 And do not iron edges that have Fabric Tac on them for at least 2 hours. It is highly flammable! Check us out at Remodelaholic's link party!